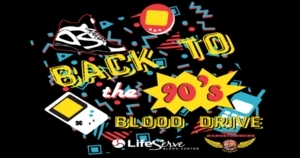 DES MOINES - The Iowa Barnstormers have partnered with LifeServe to host a "Back to the 90's" themed Blood Drive on Tuesday, May 30 at Wells Fargo Arena as they gear up for their Annual 90's Night game. The Blood Drive will take place between 12:30 p.m. and 6:30 p.m. CDT on the Iowa Barnstormers field. The first 100 donors at the "Back to the 90's" Blood Drive will receive a free t-shirt, a ticket to the Iowa Barnstormers 90's Night game, and an oil change voucher from United Fleet. No appointment necessary. Donors can enter through the VIP entrance located at the northwest corner of Wells Fargo Arena. Free parking will be available in the lot north of Hy-Vee Hall. This is a child friendly blood drive. Throughout the event, Barnstormers players will be hanging out on the Iowa Barnstormers field for autographs, pictures, high-fives, and games. For more information on this event, visit ww.lifeservebloodcenter.org or call the Iowa Barnstormers front office at (515) 633-2255. LifeServe Blood Center was established in April of 2010 when the Blood Center of Iowa and Siouxland Community Blood Bank joined operations. As one of the 15th largest blood centers in the country, LifeServe Blood Center provides blood and blood products to more than 90 hospitals located across Iowa, Nebraska, and South Dakota. LifeServe is committed to saving lives by providing premier service to volunteer blood donors and access to a safe, quality blood spply for hospitals and patients. For more information, visit www.lifeservebloodcenter.org.